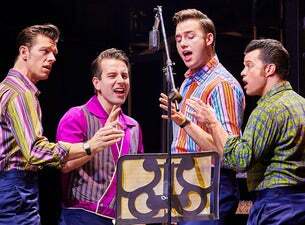 Jersey Boys, the internationally acclaimed hit musical, tells the remarkable rise to stardom of one of the most successful bands in pop music history. Winner of 54 major awards worldwide including the 2009 Olivier award for BEST NEW MUSICAL! Jersey Boys is the electrifying true life story of Frankie Valli and the Four Seasons; the Mob, the heartaches, the triumph and the music. Featuring the hits Sherry, Can't Take My Eyes Off You, Big Girls Don't Cry, Oh What A Nigh, Beggin', Let's Hang On, Bye Bye Baby and many more. This sensational production features many of the band's worldwide hits, including: Oh What a Night, Beggin', Can't Take My Eyes Off You, Sherry, Walk Like a Man, Bye Bye Baby, Big Girls Don't Cry and many more.